Identifying non-thriving students and intervening to boost them are two processes that recent literature suggests should be more tightly integrated. 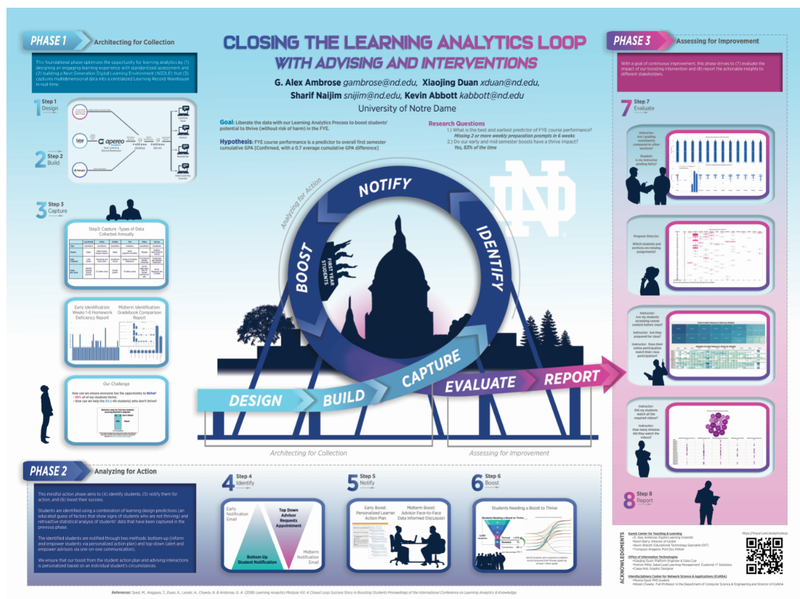 We perform this integration over six semesters in a First Year Experience (FYE) course with the aim of boosting student success, by using an integrated closed-loop learning analytics scheme that consists of multiple steps broken into three main phases, as follows: Architecting for Collection (steps: design, build, capture), Analyzing for Action (steps: identify, notify, boost), and Assessing for Improvement (steps: evaluate, report). We close the loop by allowing later steps to inform earlier ones in real-time during a semester and iteratively year to year, thereby improving the course from data-driven insights. This process depends on the purposeful design of an integrated learning environment that facilitates data collection, storage, and analysis. Methods for evaluating the effectiveness of our analytics-based student interventions show that our criterion for identifying non-thriving students was satisfactory and that non-thriving students demonstrated more substantial changes from mid-term to final course grades than already-thriving students. Lastly, we make a case for using early performance in the FYE as an indicator of overall performance and retention of first-year students. This entry was posted in Uncategorized by G. Alex Ambrose. Bookmark the permalink.